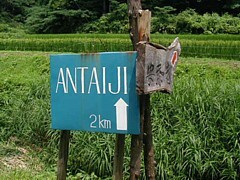 Antaiji is located about 180km north-west of Osaka, and 16km south-east of Hamasaka, the closest town on the coast of the Sea of Japan. It takes several hours by train from either Osaka or Kyoto, or one hour from Tottori to reach Hamasaka station on the Japanese Railways (JR) San’in line. Check this site to search for train connections. The closest airport is in Tottori. From Hamasaka station take a bus to Kutoyama. 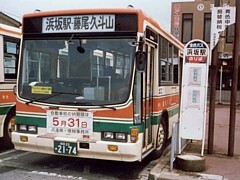 The bus costs 300 yen and takes 30 minutes to reach Ike-ga-naru-guchi bus stop at the beginning of Antaiji’s road. Get off there and walk about one hour by foot up to the temple (4km/2.5m). The road is not paved for most of its length, so rather than bringing a suitcase, you might prefer carrying a backpack. After 2km the road will part, and you will find a sign directing you to the left there (for about 500 meters, there will be an asphalt road). Please arrive in the early afternoon, as an orientation will be held before dinner. In no case should you arrive after dark, as the mountain road is very dangerous at night. On saturdays, sundays and national holidays you either have to walk 16 km or take a taxi (for around 6000 Yen). To catch the bus at noon, you will have to leave Kyoto or Osaka train stations between 5am and 6am. From Tokyo, you can either take a plain or a night bus or train to Tottori. It is also possible to spend the night at a hotel or youth hostel in Hamasaka. 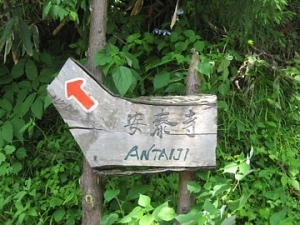 Please check the page about Staying at Antaiji and, after applying for a stay and getting permission, please send us an e-mail about one week before you come, to reconfirm your arrival and tell us at what time we can expect you. This sign after two kilometers does not stand any more. Cross the bridge here and follow the asphalt road, which turns into a dirt road again after 500 meters or so.